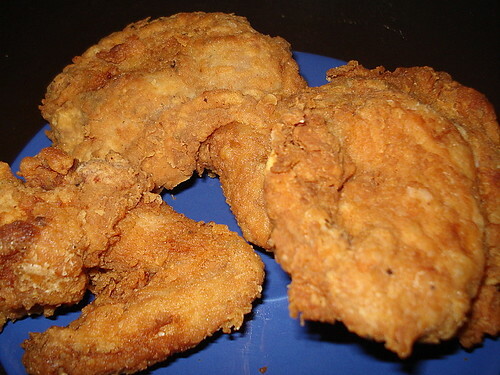 Southern Fried Chicken, originally uploaded by Camemberu. Reading Dancing Blue Seal's post on Popeye's in New York City gave me such a craving for fried chicken and fluffy biscuits! This led to the discovery that those delicious Southern biscuits are actually incredibly easy to make! Only three ingredients - flour, shortening and buttermilk (well, okay, add salt too, for better flavour). Fried chicken, yeah, also easy - just season, batter and fry - you can try Paula Deen's recipe (she's the queen of Southern comfort cooking!). So why not try them at home? 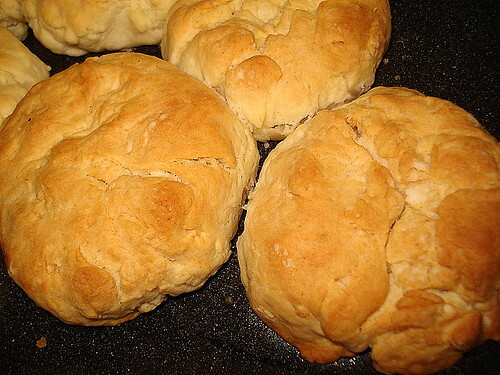 Southern Homemade Biscuits, originally uploaded by Camemberu. There ya go with the biscuits. The best results are from using Crisco or similar hydrogenated vegetable oils (unfortunately, this is TRANS FAT heavy shortening), which give it a light and fluffy texture. I substituted a lot of that with butter, and the tradeoff is a slightly harder crust (insides still somewhat fluffy). While it may not look terribly sophisticated, this video is the simplest and most elegant method I've seen so far, complete with the most soft-spoken and gentle Southern old lady I've seen. She makes it look so easy! No rolling pin or cookie cutter necessary. I've transcribed the directions (so you don't have to) and added some of my own comments in brackets. 10. Remove from oven, butter the tops and serve. They are easy to make, aren't they, biscuits? Yummy! Share your recipe too, if you can! There's a branch of Popeye's at the level above T1 departure in the public area, by the way... think it's the only one in Singapore. could I substitute the shortening with butter?